The New Acropolis Museum is an archaeological museum focused on the findings of the archaeological site of the Acropolis of Athens. The museum was built in order to house every artifact found on the rock and on its feet, covering a large period of time, from the Greek Bronze Age to Roman and Byzantine Greece but lies also on the site of Makrygianni, ruins of a part of Roman and early Byzantine Athens. The design by Bernard Tschumi was selected as the winning project in the fourth competition. Tschumi’s design revolves around three concepts: light, movement, and a tectonic and programmatic element. The museum was founded in 2003 while the Organisation of the Museum was estabilished in 2008. Finally, it opened to public on June 21, 2009. Nearly 4,000 objects are exhibited over an area of 14,000 square metres. It is easily accessible by the Metro, Acropolis Station. The monuments of the Acropolis have withstood the ravages of past centuries, both of ancient times and those of the Middle Ages. Until the 17th century, foreign travelers visiting the monuments depicted the classical buildings as being intact. This remained the case until the middle of the same century, when the Propylaia was blown up while being used as a gunpowder store (this is the side visible from the Museum). Thirty years later, the Ottoman occupiers dismantled the neighbouring Temple of Athena Nike to use its materials to strengthen the fortification of the Acropolis. The most fatal year, however, for the Acropolis, was 1687, when many of the building’s architectural members were blown into the air and fell in heaps around the Hill of the Acropolis, caused by a bomb from the Venetian forces. Foreign visitors to the Acropolis would search through the rubble and take fragments of the fallen sculptures as their souvenirs. It was in the 19th century that Thomas Bruce, 7th Earl of Elgin, the British ambassador to the Ottoman Empire from 1799–1803, had obtained a controversial permission from the Ottoman authorities to remove pieces from the Acropolis. From 1801 to 1812. Elgin’s agents removed about half of the surviving sculptures of the Parthenon, as well as architectural members and sculpture from the Propylaea and Erechtheum. The base of the museum design ‘hovers’ over the existing archaeological excavations on pilotis. This level contains the entrance lobby as well as temporary exhibition spaces, retail space, and all support facilities. The continuing excavation underneath is visible through large expanses of glass flooring. It’s amazing to see how they would cook 2.500 years ago!! Kitchens were equipped with all necessary utensils: vessels for storing solids and liquids (pithos jars, amphorae, jugs, hydriae),for olive oil (lekythoi) and for spices (unquentaria). There were also basins, plates, iron daggers, mortars, pestles and grinders for food preparation, deep and shallow cooking pots (chytrae, lopades) and vessels resembling frying pans, for roasting seeds and nuts. The food was cooked on hearths, in ovens and portable braziers and escharae, which were also used for heating their houses. The middle level is a large, double-height, trapezoidal hall that accommodates all galleries from the Archaic period to the Roman Empire. The Middle level includes a bar and restaurant with views toward the Acropolis and a multimedia auditorium, in Greek and in English and is so worth watching it. In the restaurant unfortunately only cold plates, salads and sandwiches are served and as much as I would love to eat a salad, the rest of the family wanted to eat something more substantial, so we had a cup of coffee and went to Monastiraki to eat. I loved the restaurant as each table had a pot with a different herb: oregano, thyme, mint, basil, rosemary, sage etc. control as well as unparalleled views, from the Parthenon to the Saronic Gulf. On your right you can see the Lycabettus Hill and on your left is Philopappou Hill. I have more pictures and a description of most of them in flickr. The top level comprises the rectangular Parthenon Gallery arranged around an indoor court. This level is rotated with respect to the remainder of the building, matching the exact orientation of the Parthenon and assuring that the sculptures are lighted at the same angles as if they were set in their original places. Metopes: Their design is attributed to the sculptor Kalamis. The metopes of the east side of the Parthenon, above the main entrance, depict the Gigantomachy (mythical battles between the Olympian gods and the Giants). The metopes of the west end show Amazonomachy (mythical battle of the Athenians against the Amazons). The metopes of the south side—with the exception of the somewhat problematic metopes 13–20, now lost—show the Thessalian Centauromachy (battle of the Lapiths aided by Theseus against the half-man, half-horse Centaurs). On the north side of the Parthenon the metopes are poorly preserved, but the subject seems to be the sack of Troy. The 2nd-century traveller Pausanias, when he visited the Acropolis at the end of the second century AD , only mentioned briefly the sculptures of the pediments (gable ends) of the temple, reserving the majority of his description for the gold and ivory statue of the goddess inside. Part of the East pediment is still found on the Parthenon. I hope that you have enjoyed this virtual tour I have prepared for you. On Friday when we visited the Museum I had the pleasure to meet one of the readers of Kopiaste. Nicholas and his family came from Toronto and he e-mailed me that they would be visiting the Museum. They had booked the tour just before of us so we met at the entrance. Hopefully, we shall meet when they return to Athens on their way back to Canada. I take this opportunity to thank all my readers who send me private e-mails. Finally enjoy a slide show with the Parthenon Marbles. All pictures have been taken with my new camera which arrived the evening before the visit to the Museum and the only thing I had time to do was to charge the battery! All pictures were taken with natural light and no flash on. None of the pictures has been tempered. 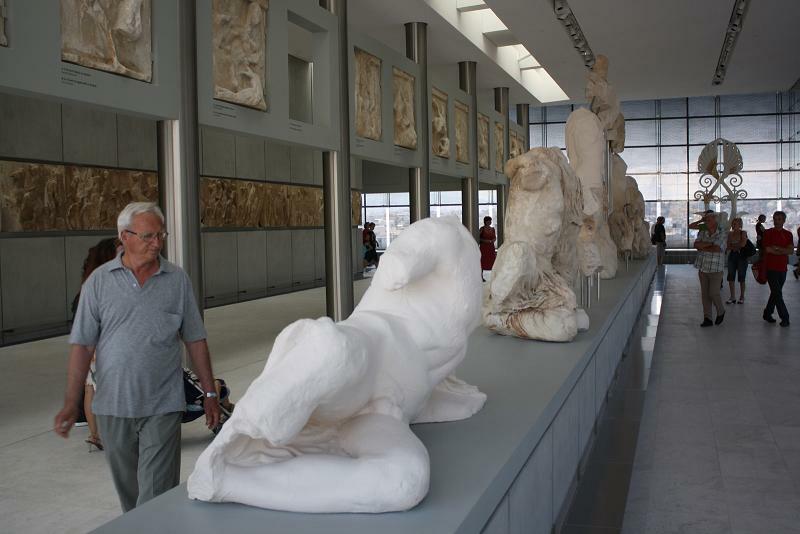 The New Acropolis Museum is now a reality and we only hope that the missing sculptures will soon return to their home place where they belong. The Guardian had set a voting for the return of the Marbles and the vote showed that 95% were fore their return. The results of the poll will be published on the 8th of July issue of the Guardian. Knowing how much trouble even one photo takes, I can see you’ve put your heart and soul into this post. Beautiful! Nice picture of yoi :-D! Wow, Ivy! You really did a great job with the tour images and video too! Ivy, the museum is very moving…especially as a Greek. I’m really looking forward to my own visit this summer. Thank you for taking the time to put this all together. This is just magnificent, Ivy! I was an archaeology student at one point in time. I would love to someday visit this. Thank-you for sharing. I tried to vote but it said voting was closed. What a great look inside the museum, Ivy. Thanks so much for sharing. Ivy, thank you so much for this awesome virtual tour! The New Acropolis Museum looks absolutely gorgeous! We can’t wait to visit Athens, it’s on the top of our list, just waiting for our daughter to get a little bit older. What an incredible post! You did such a thorough job. Now I really want to go back, since they opened a few years too late for me to have visited that fantastic museum. Thanks so much for your lovely comments. It was the most difficult post of my life, as it took me two whole days to put it together, but it was so worth it. Reeni, I didn’t know the poll closed, so I will just remove the link. The last time I checked it, it was about 94% for the marbles to return to Greece. What a lovely, informative post! I loved the video, as well. I really felt as if I took a vicarious trip there, and I’m so, so grateful. Thank you! It seems to me that artifacts should always be housed within the cultural area or with the culture that birthed those artifacts. I understand that the British Museum is concerned about losing one of their “treasures” but I’m glad to hear that Guardian readers understand the injustice, at least. 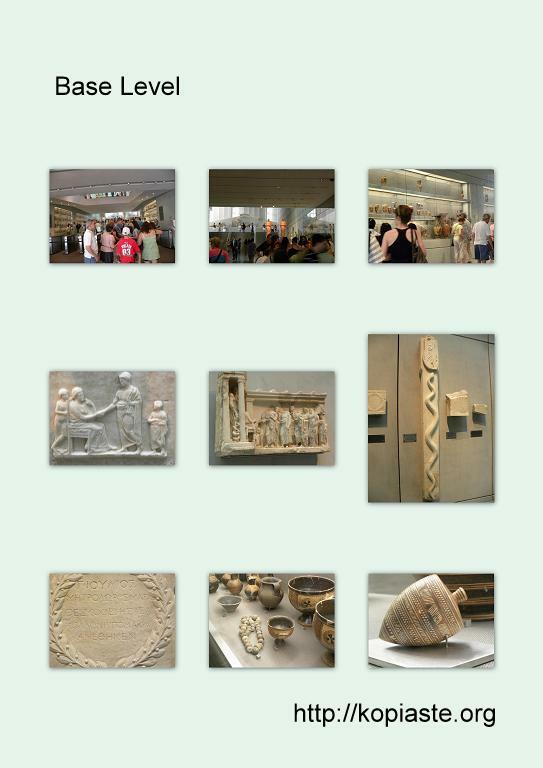 Thank you for the virtual tour of the museum…..love those earthen and delicate pots…….Hope you had rocking time out there…. This is just beautiful….A historical tours of Greece would be something I really love to have…. I am a monstrous history buff. I love old architecture, and I find it amazing what people can make with just their hands thousands of years ago. I think it’s a lost art, because stuff built in the present day will probably never last as long as these items do. Ivy, thanks for this informative post and for taking us back in time. Jenn AKA The Leftover Queen’s last blog post..Farmers Market Exchange with The Transplanted Baker! Very interesting and informative post dear, would love to visit here! Parita’s last blog post..Melon Feta Cheese Tarts, a touching experience and Awards!! Hi Ivy!! I downloaded Fox Fire, I don’t have any trouble getting on your blog now!!!! Or commenting!! LOL!!! Love all your pictures Ivy!! I am really glad you all enjoyed this post. I’ll be away again for a few days again. I’ve been receiving e-mails from friends that they cannot read my site. It seems that it is an internet explorer problem. Bunny, I don’t know how to thank you. No one else has bothered to do this until now and I am sure you will not regret you have downloaded Firefox. It’s so much better than Internet Explorer. Thank you Ivy for this wonderful look into the museum! Such a wonderful effort on your behalf! That was a very comprehensive post Ivy. I am wondering if I need to go now 🙂 Seriously though You must have spent a lot of time on it. I am definitely going to arrange to take the kids before we move out of town. They are quite young to really understand much but I feel like it is important for even little ones to understand about museum and the great works that are in them. Thanks for a lovely tour. I stumbled it. *sigh* We must get to Greece. We just must. This is a great, great experience. It looks magnificent Ivy! I have never been to Greece, but the more I see, the more I want to go. Check out all the wonderful things in Athens, then off to the gorgeous islands – have to start thinking seriously about this! The museum opening has been a long time coming but it looks like it was worth the wait. Thanks for the tour. Ivy…I got in. Do you realize it’s been over a month since I haven’t been able to log onto your blog? Everytime I tried, my computer would disallow me and shut down the page. I can’t figure it out. BUT, I’m here. I haven’t finished reading your wonderful post because I wanted to make sure you knew I was here, and I didn’t want to get shut down again. But as always, your photographs are divine. The little I read about the historical background is quite fascinating. Must read more. I’ve missed you my friend. I’ll keep trying to log onto your site. Big hugs. I hope to go there this week and try to get tickets as they were sold out so fast! So fast then you say baklava! Glad you did this video and picts too. I really want the marbles return to Greece as well. Why took something that didn’t belong to your culture and history? For the sake being named museum? Very interesting article. Thanks for sharing. 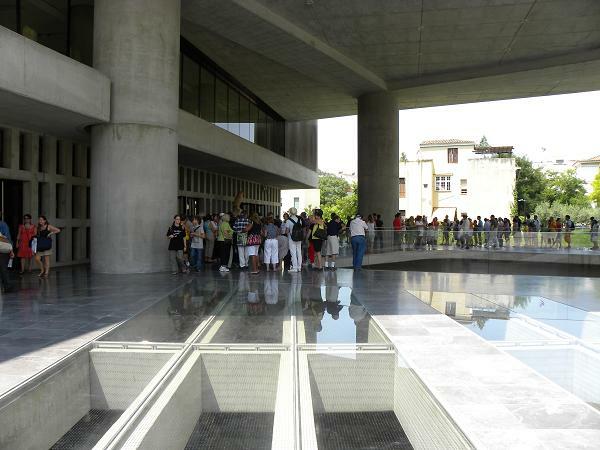 One day I will visit Athens and the Acropolis Museum. Very nice views of the exhibits. I sure wish I can visit one day. Great post. Thanks for giving the images of inside the museum. Thanks for sharing the information. Great post. Many and complexity details in your article. If only I could visit Athens! Great information, This site has lot of useful information and it is informative for people who cannot visit Athens. Thanks for the wonderful post.